I believe the micropayment investment strategy has come to maturity and am planning to try my hand at it. I have had several coals in the fire for a while that hinge on having the things created that I cannot, usually art or speech work. The ideas cycle and breath and wait for a time that I'm not sundering in the ocean of long hours and exhaustive schedules of my daily job. With the completion of our latest product, my job has reduced gears and gives me back those hours of the day and afterhours energy to get some of my other dreams out there. The main problem I do have is a lack of funds. My day job pays well, but I'm trying to quickly pay off the loans from my ambitious previous venture and take what I learned from it to make something even better. However, I'm stuck in the chicken/egg dillema. I can't get my project really rolling without cash and I can't get cash without my project rolling. For a lot of what I need, it is way less expensive to buy in bulk ahead of time than it is a few at a time to meet customer needs. For my next set of projects, I will be trying to leverage a funding paradigm created by kickstarter.com. I feel that I have a project that will fit in perfectly, is creative, and I have a good foundation of rewards to give to funders to make it more worthwhile for them to invest in me. My idea? 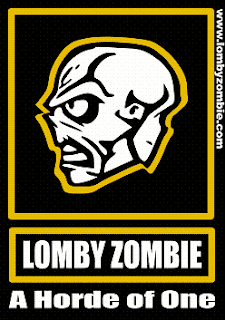 Get around to creating 'Lomby Zombie: Corporate Stiff' an add-on/standalone expansion to Lomby Zombie (LZ). I felt we did a really good job on the original LZ game and have sold 50 physical copies and about 27 print-and-play copies with a mediocre advertising scheme. Oddly enough, we have sold over 100 LZ "Horde of One" shirts. Yeah, that's right. We have sold more paraphenalia that games. Mostly because they were a big hit at Archon 2005 and it is a pretty sweet tshirt. LZ was done almost completely inhouse. We designed the game, made the tiles, printed everything, put protectant film on everything, bagged everything and shipped everything. It was a very Indy project and in the end felt that way. The one thing I outsourced was creating the art used on the cover and cards to this great artist, Paul Dozier. I have been trying to get ahold of him to see about getting more artwork done. So, what I plan to propose on Kickstarter is rewards of copies of LZ and shirts to fund the creation of LZ:CS. I'm trying to figure out the exact budget and looking into how much it would cost to have it professionally printed and cut. I would need to pay an artist to make more art. Also, I would want to have a bunch of shirts pre-printed since it is way less expensive (around $9) than having it Print-on-Demand (around $15 and usually is digital instead of screen printed).